An amazing product that is designed to deliver great bass performance with a compact and easily installed enclosure. 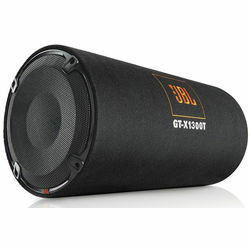 JBL GT-X1300T Subwoofer Tube comes with 1300W Peak Power Handling for seamless functioning. With a 12 inch Woofer, it is sure make your car another party destination. It measures 13 inch x 26 inch (330mm x 660mm) and has Nominal Impedance of 4ohms. The sensitivity of this subwoofer tube is 90 Decibel. An amazing product that is designed to deliver great bass performance with a compact and easily installed enclosure. JBL GT-X1300T Subwoofer Tube comes with 1300W Peak Power Handling for seamless functioning. With a 12 inch Woofer, it is sure make your car another party destination. It measures 13 inch x 26 inch (330mm x 660mm) and has Nominal Impedance of 4ohms. The sensitivity of this subwoofer tube is 90 Decibel. It comes with a Manufacturer Warranty of 1 Year.